The story behind this piece is an involved one. The basis is a black and white photograph that a friend of mine shot for another art piece I was doing. I had just gotten a divorce from an unfaithful spouse and was exploring my feelings. On the outside I was strong, I went to the gym everyday and “worked out” the emotional pain, but inside, emotionally I felt weak. I have always been attracted to the raven. I grew up in Alaska and the raven is a powerful symbol in Alaskan culture. 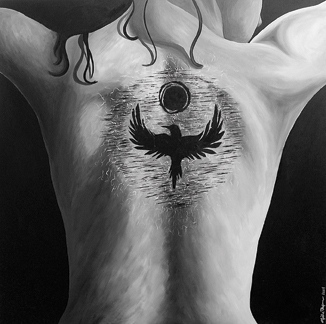 This piece represents the raven spirit within me that helped carry me through the emotional darkness of my divorce and into the light of who I really am.